Is Procter & Gamble Co. Stock Finally a Buy? P&G is having a very difficult year, but its major portfolio shake-up could lead to better days ahead. P&G is investing in its most popular growth brands right now. Source: Procter & Gamble. This has been a frustrating year for Procter & Gamble Co. (NYSE:PG) shareholders, to say the least. The company's fundamentals are deteriorating in 2015, because of a number of factors including declining product shipment volumes and the strengthening U.S. dollar. As a result, P&G is undergoing a major product portfolio transformation, in an attempt to shed many of the underperforming business lines that have weighed it down, but for a company of P&G's size, this turnaround will take time. It's understandable that investors might not have the patience to ride out the storm. After all, P&G has lost 25% of its value since the beginning of the year. But the good news is that P&G presents a better buying opportunity now than it has at any point over the past year. In the past year, P&G has announced multiple major deals to sell dozens of its brands that weren't growing. Recall that last year, P&G sold its Duracell battery brand to Warren Buffett's Berkshire Hathaway for $4.7 billion. Earlier this year, P&G sold a collection of 43 beauty brands to Coty for $12.5 billion. The brands sold to Coty include Dolce & Gabbana, Gucci, Hugo Boss, Cover Girl, and Max Factor. Also included was the Wella hair-care business. This drastic portfolio shake-up is warranted in light of P&G's struggles this year. Its total revenue declined 5% in fiscal 2015, to $76.3 billion, and GAAP earnings per share from continuing operations fell 21% year over year. To be fair, the rising U.S. dollar was a major headwind. In fact, currency exchange alone cut six full percentage points from P&G's revenue growth last fiscal year. Still, not all of P&G's problems are due simply to foreign exchange. In the past fiscal year, P&G's product sales volumes fell 4% in the beauty, hair, and personal-care segment, 3% in grooming, and 1% in healthcare and baby, feminine, and family care. These declines in volumes cannot be written off by currency fluctuations. Rather, declining volumes signal a deeper structural problem and a much more concerning decline in underlying demand for P&G's products. Therefore, P&G streamlining its portfolio is the right strategy. By selling low-growth or declining businesses, it can use the proceeds to invest in higher-growth businesses like diapers. P&G's Pampers brand remains highly successful. Pampers, its largest brand, has grown sales at a 5% pace during the past three years. For instance, P&G communicated on its last conference call that its new line of Pampers Pants are going to market in China and the U.S. right now. Management forecasts the pants segment could be worth $2 billion-$3 billion per year over the next few years. Moreover, in the aftermath of these massive deals, P&G stated its intention to return $70 billion to investors through share buybacks and dividends. The share repurchases represent a great opportunity to grow earnings per share, and P&G's dividend is near and dear to its investors. There is no doubt that P&G has struggled in recent times. But at this point, what matters more is what happens going forward. For investors thinking about buying P&G, the good news is that the stock price is a bargain compared to the levels seen earlier this year around $90 per share. P&G trades for 15 times forward earnings estimates, a cheaper valuation than the market as a whole. And a nice bonus is that the lower stock price presents a higher dividend yield. 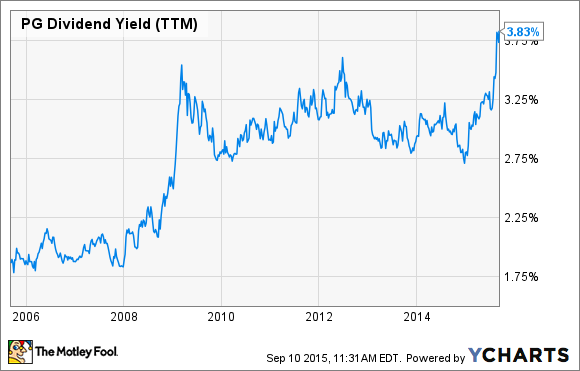 P&G's 3.9% yield is at its highest level in a decade. Plus, keep in mind that P&G's dividends are only likely to grow from here. P&G is a Dividend Aristocrat, having raised its dividend for 59 years in a row. The bottom line is that while P&G's turnaround will take time, it is still a global leader in consumer staples, with a broad portfolio of very popular products. For any investors wanting to buy P&G but haven't yet, now might be the right time.